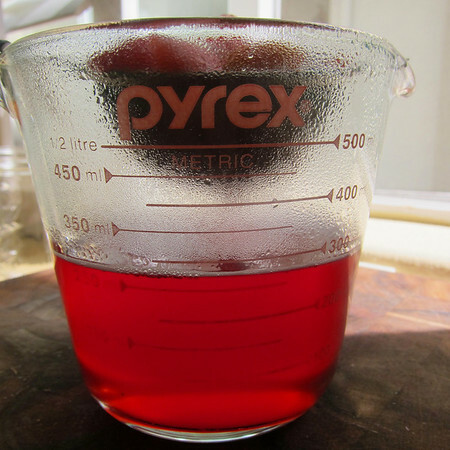 It was around…oh…January when I started thinking about things to make with rhubarb. Despite the fact that winter never really showed up in Southern California, I was already dreaming of the smell of fressia on the air and the delicate spoils of early spring. Then, in late March, “catastrophe” hit: the oven died. This wasn’t entirely unexpected. In fact, I’ve been waiting patiently for what seems like years for the stock appliances in our kitchen to gracefully go to the Best Buy in the sky. We tried to revive it, really, we did. But the appliance dude diagnosed an issue that would cost almost half of a new oven. The choice was easy: buy new. But of course, that would take research…and another two weeks passed, leaving me, the baker, without my instrument. 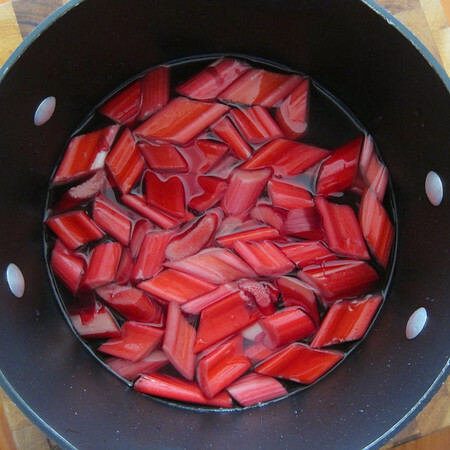 So I took to the stove with some fresh rhubarb and sugar. It’s like I always say, “when life gives you a broken oven, make a cocktail.” In some languages, this saying also translates into “sometimes it’s okay to drink your dinner.” Language and culture are funny that way. 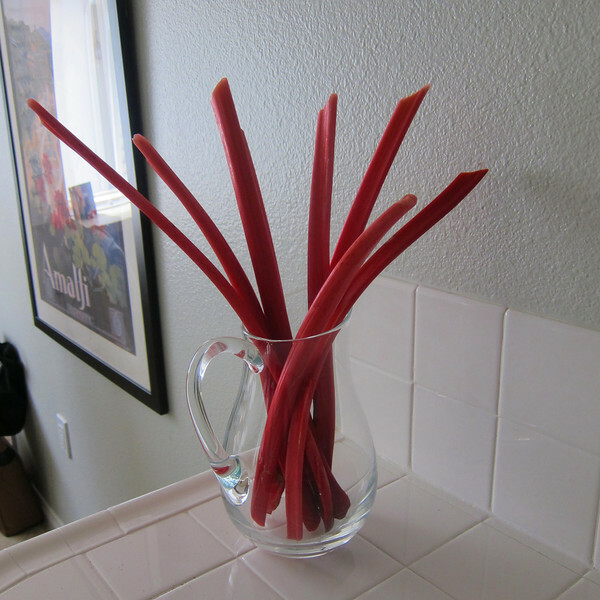 And, that’s how the “Oh Rhubarb” came to be. Pimms #1 was the most English spirit I could conjure up. The result is sort of a rhubarb Pimm’s punch. 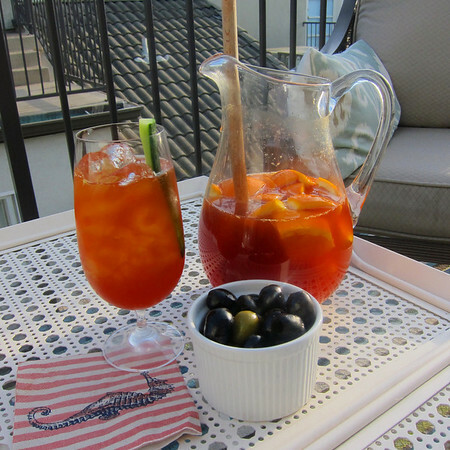 Don’t let the seemingly low alcohol content of this libation fool you, at 25% proof, the Pimms will sneak up on you. Using a heavy-bottomed sauce pan, stir together sugar and water until sugar dissolves. Add rhubarb and turn heat to high. Allow to come to a boil and then reduce heat to a simmer. Simmer mixture until the rhubarb falls apart (about 20 minutes). Strain the liquid from the rhubarb. Using a cocktail shaker filled with ice, combine Pimm’s and rhubarb syrup. The syrup will be heavier than the Pimm’s so this helps the two stick together. Pour into a high-ball glass filled with ice. Top with sparking wine, give it a mix. Garnish with an orange wedge or two and a tall wedge of cucumber. I LOVE it!!! Sorry to hear about your oven, though. 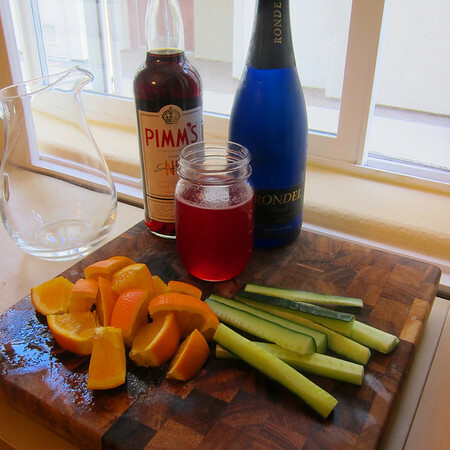 Don’t those wacky Brits also add strawberries to their Pimm’s? I bet they would pair beautifully with the rhubarb!